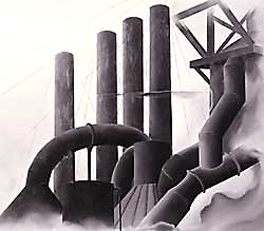 PITTSBURGH: Because she was a woman suspected of having a radical agenda, Elsie Driggs was not permitted inside the steel mill depicted here. Her only agenda was art and the capturing of the beauty she saw in the great velvet forms of the Jones and Lochland Mills. The James A. Michener Art Museum is located at 138 S. Pine Street in Doylestown. The curators gallery tour begins at noon February 12 and 19; $15, non-members; $8, members. Museum hours Tuesday-Friday 10 a.m.-4:30 p.m., Saturday 10 a.m.-5 p.m., Sunday noon-5 p.m. Admission costs $6.50, $6 seniors, $4 students, free for members and children under 6. Hours: 10 a.m. to 4:30 p.m. Tues.-Fri., 10 a.m. to 5 p.m. Sat., noon-5 p.m. Sun. (215) 340-9800. The work of Elsie Driggs (1898-1992), who was still producing extraordinary art in her late eighties, deserves better than a label like “precisionist.” For all the brilliant, painterly precision to be found in the Michener’s new exhibit, “Elsie Driggs: The Quick and the Classical,” that’s not what this spirited and many-faceted retrospective is all about. Look for information about this artist online, however, and you’ll find that she’s invariably tagged with the same label, having been the only female member of the Daniel Gallery group that art critics of the time referred to as Precisionists. According to the headline for her brief New York Times obituary, Driggs was a “Precisionist painter”; the term surfaces twice more in the course of the abbreviated entry, and it’s been automatically echoed in several reviews of the new exhibit, which will be on view in the Fred Beans Gallery at the Michener through April 13. Thoughtfully arranged by Curator Connie Kimmerle, this show transcends terminology and is definitely worth a day trip to Doylestown. Once an extension was added to the house in 1966, she finally had the benefit of her own studio, but when her husband died in 1968 she moved on. Most people at the age of 70 proceed toward a more comfortable, less challenging existence. Elsie Driggs returned to Manhattan, where her life as an artist had begun. Writing of her discovery of della Francesca, Driggs admits that at first he “had nothing to do with my vision. I liked life and movement. He was too static and classical, and yet I was drawn to him.” In fact, the Italian master haunts her work both at the beginning and end of her career, as you see when you come to the view of Hoboken she painted in 1986 when she was 88. Dear old dirty New Jersey’s Hoboken has become an Umbrian hill town dwarfed by a soft blue Italian sky. It’s a remarkable creative arc — from Art Deco-period Manhattan through the long Lambertville interlude of smaller works inspired by figures such as Hawthorne, Dickinson, and Dante, to her moving transformation of Hoboken and her surreally lovely painting of a no less Italianate sky with a portion of the Javits Center adrift in it, produced at the age of 88. These two works, painted so late in life, overwhelm all the feeble little ist-words. Precisionist, surrealist, impressionist, expressionist, constructionist become so much verbal clutter under the sky and clouds and light of ageless art.